Alf's Zoo - IT in the U.K. The Zoo hears about IT trends in the U.K. from Wales-based Chris Rixon. With BYOD and Big Data, people don't look where they are going, spending all their time interacting on social channels, updating files, answering emails. Is all this "enabling" technology too much for our gentle psyche? And are the cousins sharing too much of our data across the pond? Can your service desk do what my wife just did? Practical advice and lessons learned from Candy Crush. My wife is not technical by any means. However, she just found, requested, procured, licensed, implemented, troubleshot and ACTIVELY used an app without any help. (as for me, I’m hoping it gets retired soon!). The technology she so quickly put into service is candy crush http://en.wikipedia.org/wiki/Candy_Crush_Saga the wildly successful puzzle game. She was able to complete an entire service request cycle in a matter of minutes, at with minimum cost to both her as a customer and King as the solution provider, and do it all with a customer satisfaction rate of 99% (she would have a 100% customer satisfaction ratio but she loses 1% because I roll my eyes every time I hear ‘tasty’ or ‘sweet’ come from the mobile device (for those of you who've played candy crush you know what I’m talking about!)). Wouldn't we all love to see this simple service request scenario as part of our own service desks processes? So what is the service provider doing correctly? First, they make the ability to request their services (i.e. game in this case) very easy. It’s intuitive, it’s upfront, it’s easy to find. In my wife’s case she saw her sister playing the game. My wife searched for it, the game was the top return and she was routed directly to the page to ‘play’ it. An important search factor was that she knew exactly what the game was since images and descriptions were front and center via search results. Second, when it was time for my wife to procure and implement the game, the process took all of 3 clicks via her mobile device. This type of easy to consume request management process is so prevalent in the consumer environment; it behooves us all in IT to mimic this consumer consumption model for IT or other business services. Obviously this is an easy service to consume, but King made it easy and quick with no hiccups simply by positioning the game up front and making the procurement process as easy as clicking a couple of buttons. As my wife started playing candy crush she had questions on what certain pieces of candy do (if you’re not familiar with the game, think of super powered ‘special’ candies). In order to understand the game concepts (a.k.a. knowledge management), she Googled the game pieces and was quickly presented a simple video (note here: no text or lengthy word descriptions, just easy to find - one click videos) which gave her a brief overview of the game and what all the super powered candy pieces can do for her. The game also provides a simple knowledge delivery method available directly from the service (game). Candy crush has 3 visual pages on how to get started and what certain candy pieces can do. They also do something very important during the process. They pop up visual ‘tutorials’ on what certain game candies can do, and they have buttons for the user to push to easily access knowledge about the game and candy pieces. King understands the power of continued service. They provide a way for the consumer to get the services they need (via paid or unpaid (thanks Facebook friends!) means) and continue playing the game with its almost endless amounts of levels or puzzles. Most importantly, the company understands what it means to be social and mobile. The success of the game (as witnessed and proven by its predecessor FarmVille) can be related to the fact that it works on mobile devices for ease of use and accessibility, and it’s connected to social environments so anyone can immediately access it and interact (and brag about their scores) among their social circles. Practical advice on how we make our help desk work like candy crush? What can your service desk environment learn from candy crush? First, make your services accessible. Make services easy to search on via business users, structure your services so they are easily accessible, and display the appropriate services to the appropriate customer at the appropriate time. A well-structured service portfolio / catalog can help achieve this. The first step in a well-structured service catalog is understanding the services your business really needs – but we’ll address that in another blog on another day. Next, create easy & intuitive service offerings. And, make them easily consumable. Use pictures and straightforward text and instructions. If simple word descriptions help achieve this great, if visual or graphical help show the service, then utilize them. Visualization in the service request process is a very small, yet critical factor, and one that is often overlooked, but oddly enough goes a long way in helping the user find and request services. Especially in a business environment when users often don’t know exactly what requests are called (sometimes IT names get in the way here) or exactly what to search on. Ask yourself how consumer based services are accessible, and mimic this model. Look into creating an app store like look and feel. All too often our self-service offerings do not visually appeal to the business, nor do we enable the business to easily search for and request services. Ease of request is a major success factor in the consumer market requesting services, and it’s a great way to ensure success in IT related service requests. Interactive: enable your end-to-end service delivery process to be as interactive as possible. In each process step, whether it be during the initial stage, the approval stage or the deployment stage, keep your audience involved. There’s no reason why we can’t visually show progress to inform the business of their service request. Consider enabling ‘modern knowledge’. Look into converting traditional text heavy FAQ’s into video tutorials. Your videos don’t have to be professionally produced. Keep the content simple, friendly, to the point, and easy to find and consume. Use language and concepts your business customers understand. Provide a ‘Google like’ experience which shows relevant knowledge. And keep knowledge up-to-date. If this requires top agents to create, edit and publish data, then give them the ability to do so. Consider gamifying your knowledge creation process. It’s a fun and collaborative way to reward and encourage agents to share their knowledge (and let’s face it, your IT agents have a lot of knowledge!). process. The more we collaborate our services in the social sphere, and the more we make them accessible via mobile devices, the greater chances we have of impacting the service delivery process via service desk. Consider ways an end user can create a service in a matter of a few clicks. Leverage drag and drop functionality vs. drop downs and list of values. Have the ability to host a post peer-to-peer review models. Have the ability for services to go viral via social collaboration tools. Games (a.k.a. services) like Candy Crush can help us think differently. ITIL maestro Anthony Orr tells tales from his recent trip to Asia Pacific. Is social, mobile, cloud and Big Data as big in Malaysia as in the States? What drives IT trends over there? Why do you wear a mask, Anthony? ITSM initiatives often focus heavily on operational requirements, without paying enough up-front attention to reporting and analytics. This can lead to increased difficulty after go-live, and lost opportunity for optimisation. Big data is a huge and important trend, but don't forget that a proactive approach to ordinary reporting can be very valuable. "...users must spend months fighting for a desired report, or hours jockeying Excel spreadsheets to get the data they need. I can only imagine the millions of hours of productive time spent each month by people doing the Excel “hokey pokey” each month to generate a management report that IT has deemed not worthwhile"
In a previous role, aligning toolsets to processes in support of our organisation's ITSM transformation, my teammates and I used to offer each other one piece of jokey advice: "Never tell anyone you're good with Crystal Reports". Unfortunately, we probably made it look easier than it actually was. These reports became a real burden to our team, consuming too much time, at inconvenient times. "I need this report in two hours" often meant two hours of near-panic, delving into data which hadn't been designed to support the desired end result. We quickly needed to reset expectations. It was an important lesson about reporting. Years later, I still frequently see this situation occurring in the ITSM community. When ITSM initiatives are established, processes implemented, and toolsets rolled out, it is still uncommon for reporting to be considered in-depth at the requirements gathering stage. Perhaps this is because reporting is not a critical-path item in the implementation: instead, it can be pushed to the post-rollout phase, and worried about later. One obvious reason why this is a mistake is that many of the things that we might need to report on will require specific data tracking. If, for example, we wish to track average assignment durations, as a ticket moves between different teams, then we have to capture the start and end times of each. If we need to report in terms of each team's actual business hours (perhaps one team works 24/7, while another is 9 to 5), then that's important too. If this data is not explicitly captured in the history of each record, then retrospectively analysing it can be surprisingly difficult, or even impossible. This is the key part of an incident's record's life, in which it is highly important as a piece of data in its own right. At this point, there is an active situation being managed. The attributes of the object define where it is in the process, who owns it, what priority it should take over other work, and what still needs to be done. This phase could be weeks long, near-instantaneous, or anything between. At this point, the ticket is closed, and becomes just another one of the many (perhaps hundreds of thousands) incidents which are no longer actively being worked. Barring a follow up enquiry, it is unlikely that the incident will ever be opened and inspected by an individual again. However, this does not mean that it has no value. Incidents (and other data) in this lifecycle phase do not have much significant value in their own individual right (they are simply anecdotal records of a single scenario), but together they make up a body of statistical data that is, arguably, one of the IT department's most valuable proactive assets. We probably don't want to keep all our data for ever. At some stage, the usefulness of the data for active reporting diminishes, and we move it to a location where it will no longer slow down our queries or take up valuable production storage. "The objective of incident management is to restore normal operations as quickly as possible"
"The problem-management process is intended to reduce the number and severity of incidents and problems on the business"
In each case, the value of our "phase 2" data is considerable. Statistical analysis of the way incidents are managed - the assignment patterns, response times and reassignment counts, first-time closure rates, etc. - helps us to identify the strong and weak links of our incident process in a way that no individual record can do so. Delving into the actual details of those incidents in a similar way helps us to identify what is actually causing our issues, reinforcing Problem Management. Give output requirements as much prominence as operational requirements, in any project's scope. Ensure each stakeholder's individual reporting and analytics needs are understood and accounted for. This week, batch expert Joe Goldberg talks to the Zoo about workload automation and its impact on our travel plans, consumer choices and paychecks. From Fortune 500 companies to SMBs, today's businesses need to run big data loads with speed and accuracy just to keep up with modern customer-service demands. Joe also explains how mobility and cloud drive job-scheduling innovation. Last Monday (3rd June 2013) I was fortunate to be able to attend the first of two days at the Consumerization of IT in the Enterprise (CITE) conference at the Marriott Marquis in San Francisco, CA. This was the conference's second year, and drew a healthy attendance of delegates, many of them CIOs and CTOs for significant organizations. Consumerization is here, and IT executives are realizing the importance of embracing it. BMC were present as a sponsor, and was demonstrating several products including our new end-user-focused product MyIT. In addition to some time in the booth (in which MyIT got a great reception), however, I was also able to attend a full day of conference sessions, and with a strong agenda it was often difficult to choose between overlapping meetings. Asked if they were confident that they were ready to increase access to consumer technologies in the workplace, only 15% reported that they were "very confident". 45%, however, responded that they were "somewhat confident". Interestingly, this has doubled since the 2011 survey. Cisco - "Not so much the Internet of Things, as the Internet of Everything!" A fascinating presentation by Cisco's Marie Hattar (@MarieHattar) pointed out that over 99% of the things that could be connected to the internet still aren't. That's 1.5 trillion things, of which 96.5% are consumer objects. Putting it another way, it's 200 connectable things per person*. This, Cisco believe, is a $14.4 trillion market just waiting to be addressed, a case set out in more detail in their white paper here. We are already in the age of the "Internet of Things", they argue. The "Internet of Everything" is the next step on the journey. (*BMC's own Chris Dancy (@ServiceSphere) probably gets close to that number with a single arm, but we should probably place him amongst the leaders on this metric. You can watch him on this subject at the SDI conference in Birmingham, UK, on 19th June. More details here). There was a strong message too: "If you don't have a mobile strategy, you don't have a strategy". Brian's view is that organizations should develop their apps on mobile, then bring them to tablets and desktops. Microsoft Word, for instance, has hundreds of features, which would make no sense to a user of an iPad application. From a mobile applications point of view, one thing that was abundantly clear is that there is still no consensus on the HTML5-versus-Native debate. TradeMonster's CIO, Sanjib Sahoo (@SahooSanj) put a passionate and solid case for the former. An HTML5 approach enabled them to deploy a trading application more quickly and less expensively than their competitors. Their app is strongly rated by users, and Sanjib spoke of HTML5 being seen as a "great long term strategy", while acknowledging difficulties such as memory footprint, and the fact that HTML5 is not yet a true cross-platform technology. He also pointed out that the limited data cache available to HTML5 applications compared to truly native applications is not really a problem for real-time trading applications where live data is the key requirement. For other requirements, it's definitely more of a factor. As IT organizations diversify, Asset Managers must broaden their focus. It’s a great opportunity to build influence, but those who ignore the change risk their role becoming less relevant. A search of TripAdvisor's reviews for "bed bugs" on yields over 45,000 results! A decade or so ago, I paid a then-pretty-hefty £100 to stay in a suburban London hotel, close to the venue of a friend's wedding. It was in a handy location, had a nice-hotel name, and a reassuringly weighty price-tag. In fact, I was looking forward to seeing what my hundred pounds bought in the suburbs. To this day, that hotel trip remains a firmly-etched and very unpleasant memory. It was, simply, awful. By that, I don't mean that familiar complacently-mediocre standard that we all encounter once in a while as consumers, but properly, mouldily, thinplasterboardally obnoxious in its awfulness. I would have been scared of a fiery death, except it was too damp. With insufficient time available to turn around and walk away, I had little choice but to hold my breath and stick with it. Like many of you in ITSM, I am no stranger to hotels. Working for a number of years as a field consultant, travelling most weeks, I began to notice a new trend: the hotels coming up cheapest on the price comparison sites also had the worst reviews on TripAdvisor. Today, it's easy to see this effect: try searching for three-star hotels in a city like London, sorting by ascending price (the impact is particularly obvious on the late availability clearing sites). Simply, the rubbish hotels are seeing their prices forced to the lowest levels. Today, establishments like suburban London's Hotel Streptococcus (not its real name, more's the pity) can't get away with it any more. They improve, or they die. In addition to informing consumers, feedback has become a valuable product in its own right. It has pushed aside the old classified directory model, in which an individual business's profile against its peers was driven by advertising (evidenced by the hurried acquisition of review services by some of the "traditional" yellow-pages-style directories). The key players in the feedback market now benefit from a classic virtuous circle: the more feedback they collect, the more useful their service becomes, and hence the more people begin to both consume and produce their content. "A one-star increase in Yelp rating leads to a 5-9 percent increase in revenue"
However, while the impact may be less significant for chain hotels and restaurants (where the reassurance of brand familiarity persists), it has arguably been a huge factor in entrenching dominant brokers of other people's products and services, such as retailers and online marketplaces. IT has been the "branded chain restaurant" for decades... The familiar choice, offering a degree of certainty if not perfection (Ray Kroc, founder of McDonalds, advocated that customers didn't want a perfect burger as much as they wanted burgers that always taste the same). But just as reviews have boosted independent restaurants, they will bolster be best upstart IT providers. Suddenly, the uncertainty is within: how can I be confident in my IT department's new, unrated cloud storage service, over a five-star-rated public service? IT departments are evolving into "brokers of services", some self-provided, others bought in. Our customers expect to self-select service offerings, and IT even needs to justify its role in being the front-end for that solution. External providers will increasingly provide reviews and feedback, driving engagement and confidence with our customers. IT needs to do the same. Feedback is a huge part of a consumer's experience. There is no reason to believe it won't be one of the major factors in consumerization of corporate IT. Alf's Zoo - This week, competitive intelligence watchdog, David Johnson, tells us about social, mobile and cloud. What are vendors doing and do companies care about BYOD, consumerization of IT and real-time collaboration? business success is critical because every organization is different. necessary to empower those end users in the way that works for them. demand, or hybrid deployment to fully attain true IT Operations Management (ITOM) and enjoy the benefits of business service management. a rose by any other name is a rose. You can’t call a SmartCar a Porsche by painting a racing stripe on it. Although SmartCar's definitely have their place because as I mentioned, one size does not fit all! Questions 2-20: Refer to question 1. Being lucky enough to work for something of an pioneering ITIL adopter back in the late 1990s, I guess I was a CMDB practitioner earlier than most. Back in those days, there was little "off-the-shelf" CMDB technology, and even automated discovery was in its infancy, with little adoption. But we were driving our ITSM initiative ambitiously, and every year the ITIL auditors would come and score us. We needed a CMDB pretty quickly, and it was clear we needed to built it ourselves. On our first attempt, we built a tool that wasn't really up to the task of holding the data we needed to hold. That was definitely our fault, although ITSM platforms were pretty simplistic back then too. With no off-the-shelf CMDBs to buy or to benchmark against, we were pretty much on our own, and we got our design wrong. We abandoned that, and tried again. "A database that contains all relevant details of each CI and details of the important relationships between CI"
Great, that's clear. We need everything. 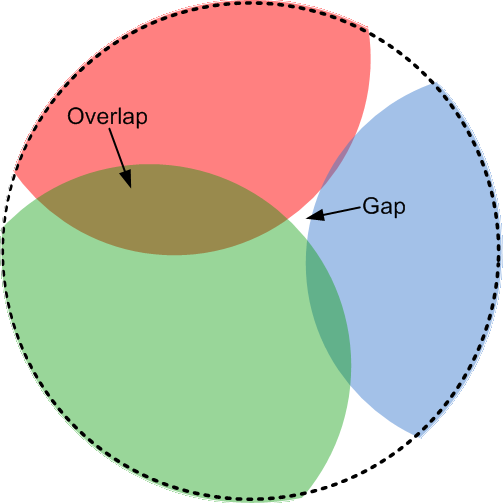 If there are overlaps - i.e. objects of required CMDB data which could be sourced from more than one place, you need to determine the best source. A good CMDB tool needs to support effective reconciliation of multiple sources, with appropriate priority for the best source of each item. Know how every piece of data is kept accurate. As soon as governance fails, trust is lost in the CMDB. That's fatal. 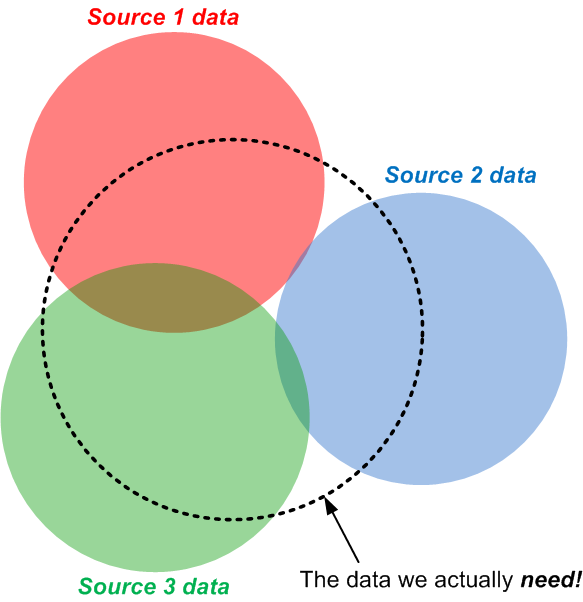 Of course, as the middle diagram above illustrates, some data sources might actually provide more data than the initial requirements set requires. For example, automated discovery tools may gather a lot more information than is initially needed. This isn't necessarily a bad thing: future requirements or investigative data mining might each benefit from this data. If there's little extra cost to maintaining this extra data (as might be the cost if it's automatically supplied by discovery tools), then it might be worth hanging on to. If it's complex, manual, time consuming, and doesn't support any outputs, then why bother? For more detailed reading on the right way to do things, BMC publish an excellent Step by Step Guide to Building a CMDB. Imagine what your business could do if it was able to recover hours and hours of lost productivity per month for every employee? For all the benefits modern technology brings to the workplace, there’s also a largely hidden cost generated by the “friction” associated with using and accessing IT systems and services. You’ll recognize IT friction from an business user’s perspective: It’s the time lost in raising or chasing requests with IT, finding and connecting to printers, WiFi and other facilities in the office. It’s the having to wait around to get your PC fixed, take on a new hire, commission a new service, contacting IT to report a problem that they’re already aware of - etc. etc. To get a handle on just how much time businesses are losing, we commissioned a survey in partnership with Forrester Consulting. You can read the report here and explore the thought provoking data and conclusions in detail. And as you’ll come to realize, friction for business users invariably means additional cost and inefficiency for IT. So what can you do to make interacting with IT a smoother, more pleasant and productive experience? I’m not sure when as a society, the effort of dropping down a list became burdensome, but it has, and things are all the more useable for it. If the percentage of your employees who actually use your self-service portal is very low (and most are) you need to think very carefully about how easy it is to find and use. Employee expectations are now very high as they experience cutting edge design and the highest levels of usability in the apps they consume outside the workplace. You can very easily order a week’s worth of groceries from your phone because someone has really thought about how to make that experience as easy (and repeatable) as possible. The ability to make that grocery order from a phone or tablet wherever that person happens to find themselves is also rapidly becoming the norm. In fact, it was these expectations of familiarity and ease of use, coupled with an increasingly mobile workforce that helped give shape to our MyIT app. Remember the more effective and accessible your self-service is, the more likely business users are to use and embrace it - and you’ll finally reap the long promised rewards of the self-serve model. The modern workplace is frenetic, fast paced and increasingly not restricted to a single physical location. Do modern business users want to wait around at a facility they didn’t choose, miles from where they’re supposed to be, just so you can swap out a hard drive? The answer, of course, is a resounding no. The major technology retailers understand the demands of modern working life very well. Many now offer an in-person support facility in their stores - where you can book an appointment to see an expert at a pre-agreed time and location. Fitting in around their customer’s lives has actually fostered greater efficiencies for both sides and has deepened the customer-supplier relationship. It’s not a huge surprise to discover that more and more of our customers are choosing to create in-person, concierge style support desks. Employees respond very well to being able to make an appointment at an agreed location and at a time that suits them. For IT, it means better predictability, greater efficiency and a closer more personal relationship with the customer. If you’d like to understand more about how a concierge bar might work in your organization, you can check out this great SlideShare presentation. When you’re ready to dive into the detail, you can also get our free in-depth guide to build and running face-to-face support. Again, there’s no point building a concierge bar if the process surrounding it is complex and cumbersome. To see just how easily appointment driven support can be integrated into IT self-service, take this interactive guided tour. Knowing exactly who is accessing your self-service facilities allows you to tailor the content they see and the services they can access. It also allows you to reduce the effort involved in raising tickets, as lots of useful information can be pre-populated based on knowing the identity of the requestor. But what if you also knew precisely where that end user was too? What if you knew, for example, that not only was Alice in sales, but that right now she’d just stepped into your London office? How much more aligned could the information and services you present to her be? Location based service and support is going to be one of the most important factors in genuinely transforming an end users experience (and perception) of IT. You can ensure that the notifications you provide to Alice are timely and appropriate to her role and location. You can offer her support that’s specific to the facility she currently finds herself in. You can provide connectivity information, the location of key devices and how to connect them. You can even provide floor plans and maps of where everything so she can orient herself in unfamiliar surroundings. Modern mobile computing devices are opening up new kinds of contextual information about their users. This information can now be used to massively enrich the IT experience and eliminate a lot of the wasted effort both sides expend in tracking down the right services at the right time. Location bases service support is a reality here and now. You can see how we’re using location information in MyIT to deliver new capabilities in IT services and support in this interactive demonstration. I’ll be exploring a number of these themes in more depth over the coming months, but it’s clear that putting yourself in the shoes of a modern business user can reveal a great deal about where the potential sources of IT friction might lie in your organization. Hopefully, I’ve also introduced you to some of the latest thinking in how we can respond to the changing expectations and demands of supporting the modern workforce. This week, we get a report from Katie Tierney on what turns on IT organizations. Apparently, it's all about the customer experience: from zero to a million moments of truths in a flash. Social, mobile, big data and predictive support are no longer just cool tools - they are must-haves for IT as next-generation employees enter the workforce. BMC MyIT, the first and only mobile business app for the IT consumer, is now available in the Apple App Store. Download it. Review it. Share it with friends. Users can search for answers in the knowledge database and receive important updates pushed out by IT. They can solve routine issues, schedule appointments and initiate new service requests, with a couple of clicks. And because MyIT knows who the users are and where they are located, IT can provide faster and more personalized assistance. MyIT transforms the IT experience, giving staff greater autonomy and flexibility to work wherever, whenever and however they want.